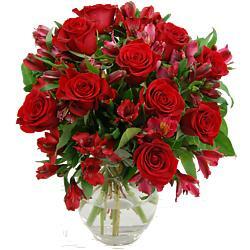 Red Alstroemeria flowers are contained in the following bouquets which are available for next day delivery in the UK. Alstroemeria! The Peruvian Lily, the Lily of the Incas... or even "Ulster Mary". This plant goes by many names; thankfully, they're all just as pretty. Alstroemeria are long lived perennial flowers which are native to South America. Originally, these plants come from just two areas -- one in Eastern Brazil, and one in Chile. They have big, showy flowers with six petals. The cool pale alstroemeria in our wedding bouquets add a gentle touch of class. Alstroemeria closely resemble Lilies and Amaryllis -- look at those pages for more sumptuous flowers.